The Scholastic Book Fair is coming to our school this week, and we invite you to come and share in this celebration of literacy with us! Now more than ever, reading is vital to leading a better life. It is the door opener to the 21st century for all children. Knowing how to read is just the beginning. Motivating young people to KEEP READING, comprehend what they read and develop the ability to think creatively are the end goals. Children need ACCESS to great books and the opportunity to CHOOSE what they want to read. Moreover, they need TIME for reading. Scholastic Book Fairs has the books to motivate more reading. With your involvement, we can inspire children to practice reading and read more often. Together, we can make a difference in their lives that will last a lifetime. One great way to ensure our children get started with reading and keep on reading all year long is with the Classroom Wish List program. We urge you to stop by the CWL display when you first arrive at the Fair. Take a moment to learn how purchasing books and donating them to your child’s classroom, can give little readers even greater ACCESS to the books they want to read by expanding existing classroom libraries. We asked each teacher to fill-in her “book wish list” prior to the fair. Look for your child’s teacher’s name on the display. All teachers took great care in selecting the best and most appropriate books to meet their students’ reading levels and learning needs. It is their wish that these books become a permanent part of the classroom library. We will recognize every generous gift you make with a special bookplate, identifying your family or child as the donor. We will display the Classroom Wish List at the book fair, so keep an eye out for it! Your support can help a classroom blossom with new and exciting adventures in reading, stimulating young minds for years to come. We hope to see you at our Scholastic Book Fair. Together, we can raise readers! THE BOOKFAIR "A message from Teacher Nancy, the Librarian..."
The Scholastic Book Fair is coming to our school this week! What better way to promote reading to our students than by supporting this important literary event. You will find hundreds of quality books at our Book Fair with a wide assortment for all reading levels. On Monday, your child will be bringing home the Scholastic Book Fair flyer that provides a preview of only a FEW of the many books available to purchase at our Fair. 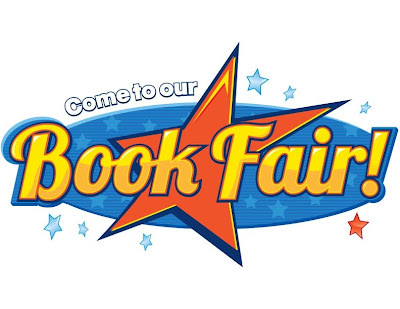 Do not forget to mark the Book Fair dates on your calendar! We look forward to seeing you during our Scholastic Book Fair and thank you, in advance, for supporting this great literary fundraiser. Mostly, thank you for believing in books and the importance reading has on your child’s future.